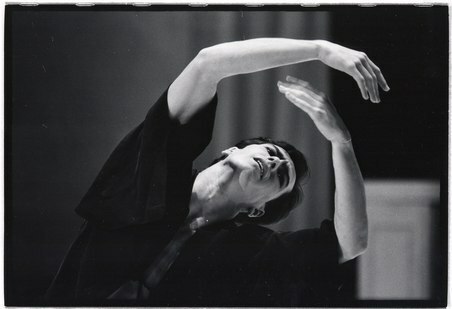 Nijinsky (2000): Choreography by John Neumeier, Piano Music Performed by Richard Hoynes: Frederic Chopin (Prelude No. 20 in C -minor) and Robert Schumann (Faschingschwank aus Wein), Recorded Music: Nikolaj Rimskij-Korsakov (Scheherazade), Dmitri Shostakovich (Sonata for Viola and Piano), and Dmitri Shostakovich (Symphony No. 11 in G-minor). The Cast: Alexandre Riabko (2/21) and Jiri Bubenicek (2/22) as Nijinsky; Heather Jurgensen (2/21) and Anna Polikarpova (2/22) as Romola Nijinsky, his Wife; Niurka Moredo (2/21) and Elizabeth Loscavio (2/22) as Bronislava Nijinska, his Sister; Yukichi Hattori as Stanislav Nijinsky, his Brother; Lloyd Riggins (2/21) and Ivan Urban (2/22) as Serge Diaghilev, Impresario and Mentor; Joelle Boulogne as Eleonora Bereda, Nijinsky's Mother; Carsten Jung as Thomas Nijinsky, His Father; Laura Cazzaniga (2/21) and Heather Jurgensen (2/22) as The Ballerina, Tamara Karsavina; and Thiago Bordin as The New Dancer, Leonid Massine. The Dancer Nijinsky: Arsen Megrabian (2/21) and Alexandre Riabko (2/22) as Harlequin in Carnaval; Arsen Megrabian (2/21) and Alexandre Riabko (2/22) as the Spirit of the Rose in Spectre de la Rose; Otto Bubenicek as the Golden Slave in Scheherazade; Thiago Bordin as the Young Man in Jeux; Otto Bubenicek and later Carsten Jung as the Faun in L'Apres-midi d'un Faune; Ivan Urban (2/21) and Lloyd Riggins (2/22) as Petrushka; Yukichi Hattori, and Arsen Megrabian (2/21) and Alexandre Riabko (2/22) as Nijinsky's Shadows. Les Ballets Russes: Laura Cazzaniga (2/21) and Heather Jurgensen (2/22) as Tamara Karsavina, as the Sylphide in Les Sylphides, as a Young Woman in Jeux, as a Nymph in L'Apres-midi d'un Faune, and as the Ballerina in Petrushka; Niurka Moredo (2/21) and Elizabeth Loscavio (2/22) as Bronislava Nijinska and as the Chosen Virgin in Le Sacre du Printemps; Helene Bouchet and Adela Pollertova as Ballerinas of the Mariinsky Theater; Sebastien Thill and Thiago Bordin as Partners; and members of the Company as Corps de Ballet, Character Dancer, and Dancers in Scheherazade. The World outside Nijinsky: Richard Hoynes as Pianist and members of the Company as Guests at the Suvretta-House and Fans of the Russian Ballet. Wedding Guests, Figures of Nijinsky's Inner World, and The War: The Hamburg Ballet company members. John Neumeier, from Wisconsin, is Founder (1973), Director, and Chief Choreographer of The Hamburg Ballet. His other works include a 2000 production of Giselle and Winterreise in 2001. He has been Guest Choreographer of American ballet Theatre, Paris Opera Ballet, and The Royal Ballet. Mr. Neumeier founded The School of The Hamburg Ballet in 1978 and was given the Order of the Federal Republic of Germany, the German Dance Prize, and the Prix Diaghilev. Vaslav Nijinsky was born in Kiev, Russia, in 1889 and studied at St. Petersburg's Imperial Ballet School. He met Serge Diaghilev in 1908 and toured in Paris with Ballets Russes in 1909 to critical acclaim and enormous attention. In 1912-13, Nijinsky choreographed and produced L'Apres-midi d'un Faune, Jeux, and Le Sacre du Printemps. When he married Romola de Pulsky, Diaghilev dismissed him from Ballets Russes. Yet, in 1916 he re-joined the Company and created Till Eulenspiegl. In 1917, Nijinsky settled with Romola and daughter, Kyra, in St. Moritz as WWI continued. On January 19, 1919, Nijinsky danced publicly for the last time at Hotel Suvretta-House, St. Moritz, in a mad "Dance with God". From 1919 to 1946, Nijinsky was treated in mental institutions and later died in England in 1950. (Company Notes). How does one begin to describe a two and one-half extravaganza of wild and exotic dance, a military symphony, larger than life sets, historical costumes that quote signature ballets, performers that appear and re-appear in different personas, as shadows, as past family gone insane, as lovers, as prey, and as predators, and an extrapolated, visual and layered autobiography, in no order of chronology or structure, all of which are occurring within the mind of Vaslav Nijinsky, the superstar ballet principal of Diaghilev's Ballets Russes, once named "Le Dieu de la Danse"? I decided to see this ballet twice in two days, with two different lead casts, in order to absorb the surprising symbolism and abstracted action that the genius, John Neumeier, a Nijinsky aficionado, has created for audiences around the world, who still treasure the ballets and incredible tales of the infamous Nijinsky. With Richard Hoynes on an offstage piano, treating the City Center audience to Chopin, as they took their seats, the glaring white stage set of the Suvretta-House in St. Moritz was a striking image, and we imagined ourselves as the audience that awaited Nijinsky's final "Dance with God", prior to 30 years of treatments in mental institutions. I enjoyed the uncharacteristic chatter of the small ballet corps that posed as the audience for the first and final acts of this exceptional work. To Hoynes' mastery of Schumann's allegro movement of Faschingschwank Aus Wein, Alexandre Riabko, on Saturday, and Jiri Bubenicek, on Sunday, danced at first in a strange, embryonic and spasmodic style, and then in a more pleasing conventional form, with the onstage audience reacting as one would imagine. Mr. Riabko had a more external and uninhibited interpretation of the Schumann, and Mr. Bubenicek seemed to exude the passion and persona for which Nijinsky is famous. Both were brilliant adaptors of the ever-changing character that evokes the fire of love and betrayal, followed by the passion of war and sacrifice, throughout this complex ballet. In a brilliant red dress, Nijinsky's wife, Romola, with Heather Jurgensen, on Saturday, and Anna Polikarpova, on Sunday, sat on the sidelines of the Suvretta-House, watching her husband with adoration and protective sorrow. There was a more classical and reserved performance by Ms. Jurgensen and a more sensual and unrestrained performance by Ms. Polikarpova, noticeable in both acts. The sailors begin to dance behind Nijinsky in a child-like fashion, and soon we recognize the very flexible, Yukichi Hattori as Stanislav, Nijinsky's brother gone mad, rolling in a straight jacket, and flailing in alienation and angst. The tall, lanky figure in top hat (looking more like a Toulouse Lautrec invocation than the actual portly Diaghilev) mesmerizes the onstage dancer, who leaps over the porch railing and is whisked off in his master's arms, like a dependent child. Lloyd Riggins, on Saturday, and Ivan Urban, on Sunday, were both superb in virtuosity and theatricality. I found Mr. Urban to exude vulnerability and Mr. Riggins to appear more wily. This was a ballet of thoughts, of Nijinsky's haphazard memories of his childhood (his mother, father, sister, brother, and teachers), of Romola (whom he met on a cruise ship and married, seriously alienating his sponsor, Diaghilev), of Bronislava, his sister (who danced and choreographed in her own right to international acclaim), of the Ballets Russes (and his favorite partners, and the ballet, Les Sylphides, and the energetic Corps), of the various roles he danced (including Petrushka, the Golden Slave in Scheherazade, the Spirit of the Rose in Spectre de la Rose, Harlequin in Carnaval, the Young Man in Jeux, and, of course, the Faun in L'Apres-midi d'un Faune), of his choreographies (such as Le Sacre du Printemps), and of World War I (and its horrors and merging similarities with Le Sacre …). 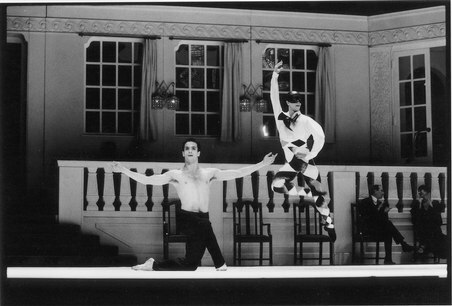 It was also a ballet about Nijinsky's memories of Diaghilev's rejections and about competition with Leonid Massine, the new dancer in the Company (seen here "dancing" tennis in Jeux) and of Nijinsky's eroticism, both for Romola and for Diaghilev. In fact, the eroticism was illustrated with the exact body language, usually reserved for L'Apres-Midi…, at various points in this ballet extravaganza, but the scarf was held partly by another dancer, perhaps one of Romola's extra-marital lovers. I found it necessary to see this ballet twice, as there were so many dancers in changing roles and so many characters that had multiple dancers representing them at various stages of their relationship to Nijinsky. Furthermore, there were so many dancers that performed the role of Nijinsky at various stages of his career and family relationships, and even dancers as Nijinsky's shadows and different Fauns and Harlequins. It was not critical to keep track of who was dancing who, but rather to maintain the flow of the Gestalt, to see and imagine the parts as a whole, like extrapolated moments of Nijinsky as dancer, as husband, as son, as lover, as choreographer, and as psychiatric personality, gone mad. Neumeier's Nijinsky was evocative of a Picasso painting, of the uneven and unusual faces and figures, that exuded an emotion, rather than a likeness. The concept of sets, costumes, and lighting were both minimal and exhaustive. Maestro Neumeier reconstructed a Léon Bakst set that was lowered and then lowered again, with swimming fish and bright, innocent colors. 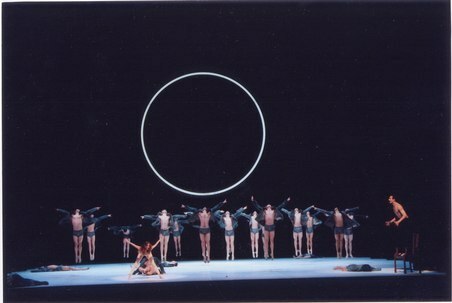 He also created enormous circles of light against a black background, through which dancers walked and disappeared. There were the blazing colors of Scheherazade's billowing costumes, whirling to the hypnotic Rimskij-Korsakov score, as well as the brief and pale, blue body costumes, perhaps indicative of psychiatric patients. There were the Degas-like ballet tutus and the open, military jackets over boxer shorts that merged Le Sacre… with the Shostakovich Symphony No. 11. There was the blazing white light on the Suvretta-House patio and the subsequent fading into darkness that were so symbolic of Nijinsky's mental meltdown, culminating with the reams of black and red material that wrap Nijinsky, during his "Dance with God". I am in awe of John Neumeier and this production of Nijinsky, about an artist, who is so renowned, yet so enigmatic. I am in awe of the virtuosic dancing of The Hamburg Ballet, as well as the pathos, passion, and poignancy, exuded by the leads, in their various characterizations of contemporary, historical, and imaginary figures connected to Nijinsky. Here is a Company that not only can dance, but also can act and can draw the audience into the feelings and fantasies, so intrinsic to the ever-shifting themes. Kudos to John Neumeier and The Hamburg Ballet. And, kudos to Vaslav Nijinsky.